Frozen pineapple juice may not look pretty, but it’s pretty tasty. This is yet another one of my beers that may drive style sticklers a bit crazy. I know saisons aren’t traditionally fruity, other than the flavors that the saison yeast may add to the beer. However, I took inspiration from two recent episodes of Basic Brewing Radio (BBR) and combined them into something new, at least for me. On the October 17, 2013, episode of BBR, homebrewers Brook Baber and David Bauter shared their version of graf, which is a fictitious apple-based beer from the brain of author Stephen King, introduced in the Dark Tower series. In addition to apple juice, Brook and David used pineapple juice in their “graf” and added it in frozen form at the end of the boil. On the December 5, 2013, episode of the podcast, homebrewer Bryan Gold shared tips on brewing saisons with fruit, including prickly pear, raspberry, and blackberry. All of the above were delicious and showed how fruit can be introduced into beer in a way that achieves tasty synergy – greater than the sum of their parts. In each case, the fruit played well with the beer elements. I decided to combine the technique of adding frozen juice to the wort with brewing a fruit saison. I really enjoyed my Spur of the Moment Saison, and I thought it would be a good base beer to build upon. The original recipe featured American hops prominently, which made a good pair to the flavors brought to the table by the Danstar Belle Saison yeast. Sorachi Ace hops have a lemony character. I kept the grain bill the same: American two-row barley with a bit of malted rye for body and head retention. I switched out the hops a bit, using Magnum for bittering with Mosaic and Sorachi Ace at the end of the boil for flavor and aroma. For the juice, I found a quart (about a liter) jar of organic, preservative-free, pasteurized pineapple juice from the local natural foods co-op. 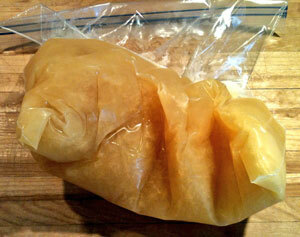 I poured the juice into a one-gallon freezer bag and froze it. Adding frozen juice at the end of the boil has an added benefit of helping to cool down the wort. I didn’t take a precise reading, but it did seem to knock several degrees off the heat of the wort before I hooked up the wort chiller. 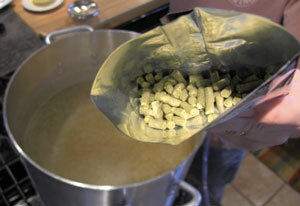 This should help preserve the character of the hops added at the end of the boil. After chilling, I transferred the wort into the fermenter, pitched a package of the Belle Saison yeast (rehydrated), shook to aerate, and put it into a small bathroom, which should be protected from the chill of the remains of the ice storm outside. The morning after pitching, the yeast was very happy, and the aromas from the airlock are very encouraging. Stay tuned . . . Collect wort and boil for one hour. I gotta try this. I love mosaic hops- it will probably be hard to tell to where the pineapple ends and the hops starts. I have seen you use the danstar saison yeast a few times now- what are your impressions of it? Is it just good enough to use when you’re feeling lazy and don’t want to bother with liquid yeast, or good enough to stand on its own? I love dry yeast for its convenience, and US-05 has completely supplanted the other Cal Ale strains for me. I’ve only used it once before, but I liked it. Ah, it sounded as if you had used it a few times, but it must just be because I heard you talk about it on BBR, BBV, and BAWJ. I’ll definitely have to small batch a nice blonde with it come spring, but for now I need to take advantage of the cold to brew some big’uns. My ground water is only cold enough to chill effectively in the winter, and I keep my house 5F colder because I’m cheap. That’s a smart answer to a dilifcuft question. This sounds like a tasty brew. Pineapple is one of those things that I love when it’s done right, but hate when it’s done wrong. Looking forward to hearing the final verdict! I was really confused, and this answered all my quseniots. Total zombie reply here, but how did this turn out? Anything you’d do different, or any notes?